Who doesn't love playdough? It is so much fun to play with. My 2 1/2 year old LOVES to get her hands messy, so playdough is right up her alley. I try my best to tap into as many of her senses as possible during our "tot school" time each day. 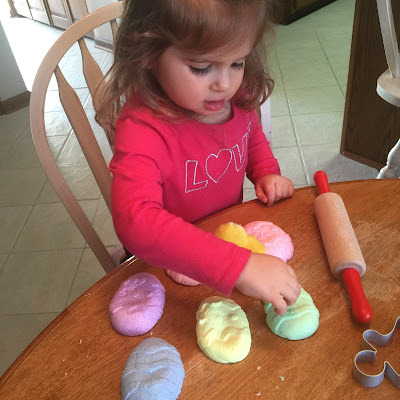 Making our own homemade playdough sounded like fun. So off to Pinterest I went. And oh my goodness... there are like 5 million recipes out there. Ok, maybe not 5 million, but there are a ton. 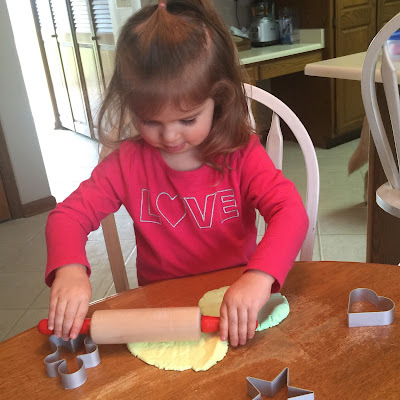 I wanted something easy and simple, so my toddler could help. Making playdough on the stove is not exactly toddler-safe. 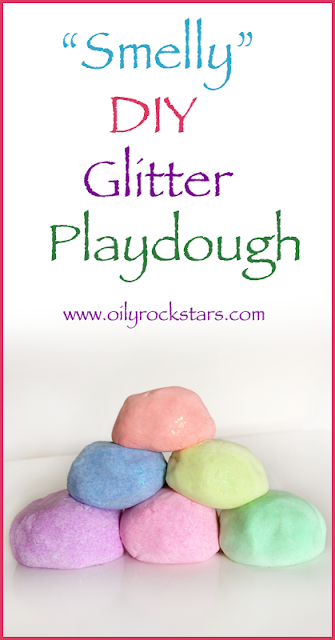 So I decided to experiment and guess what... we created the prettiest, softest and best smelling playdough ever! This recipe is so super simple. Basically it's a 2:1 ratio. Two parts cornstarch to one part lotion. 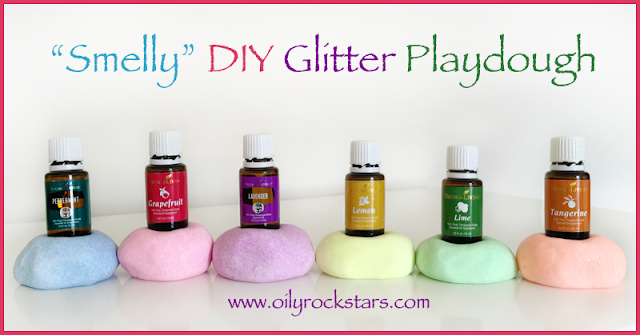 For each color I added 1/4 cup corn starch and 1/8 cup lotion to a bowl. Add in your desired glitter amount. I used A LOT. We love glitter!! Add your desired essential oil scent. I used 4-5 drops for each color. Mix together until a ball starts to form. Add a small amount of lotion or cornstarch if needed to get the right consistency. At this point, I find it's easiest to finish mixing together with my hands. Pick up the ball and massage between your hands. There you have it! Be sure to store in an airtight container when you aren't playing. We had fun rolling it out, making cut-outs of different shapes and working on fine motor skills. 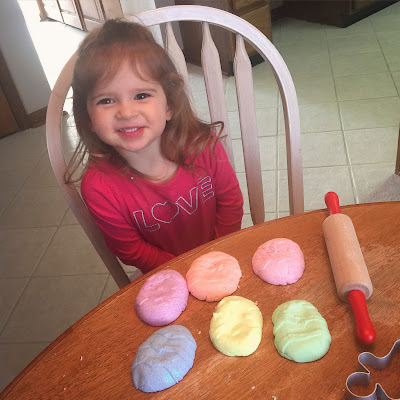 My little girl also loved making egg shapes with my Easter Egg silicone mold. I thought I would share another way we like to use our playdough recently for developmental purposes... although don't tell my little one. She thinks it just FUN!! 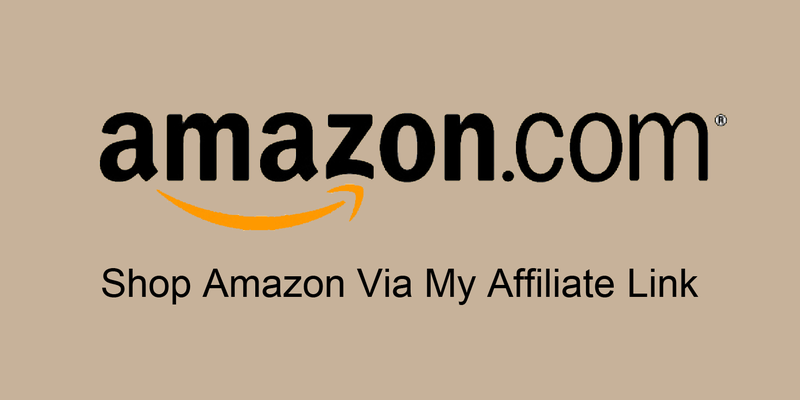 I like to choose essential oils that are great for focus and happy moods. 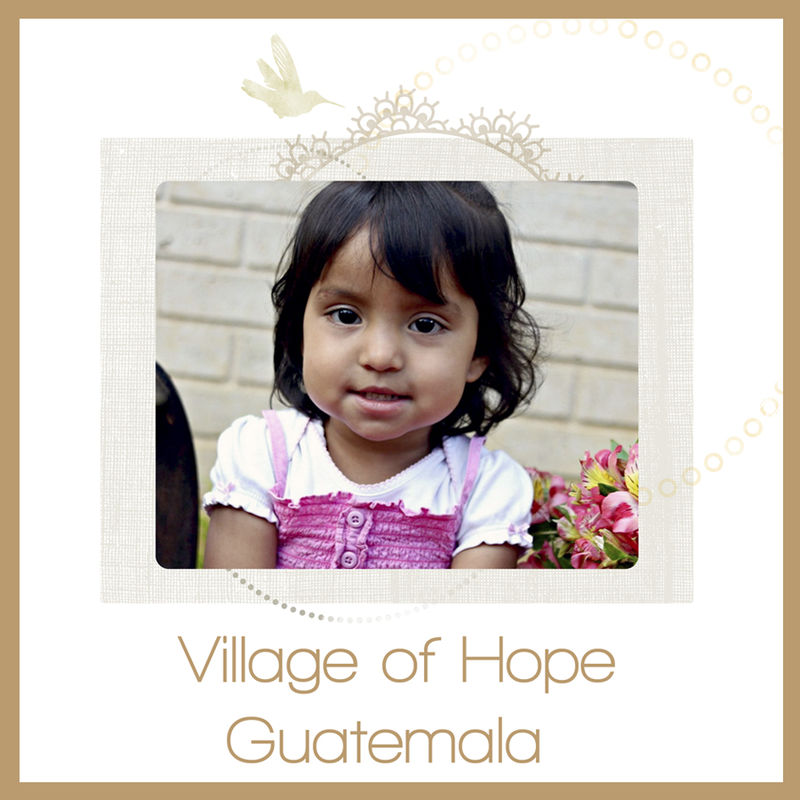 Some our favorites are Orange, Grapefruit, Lime, Lemon, Peppermint and Lavender. 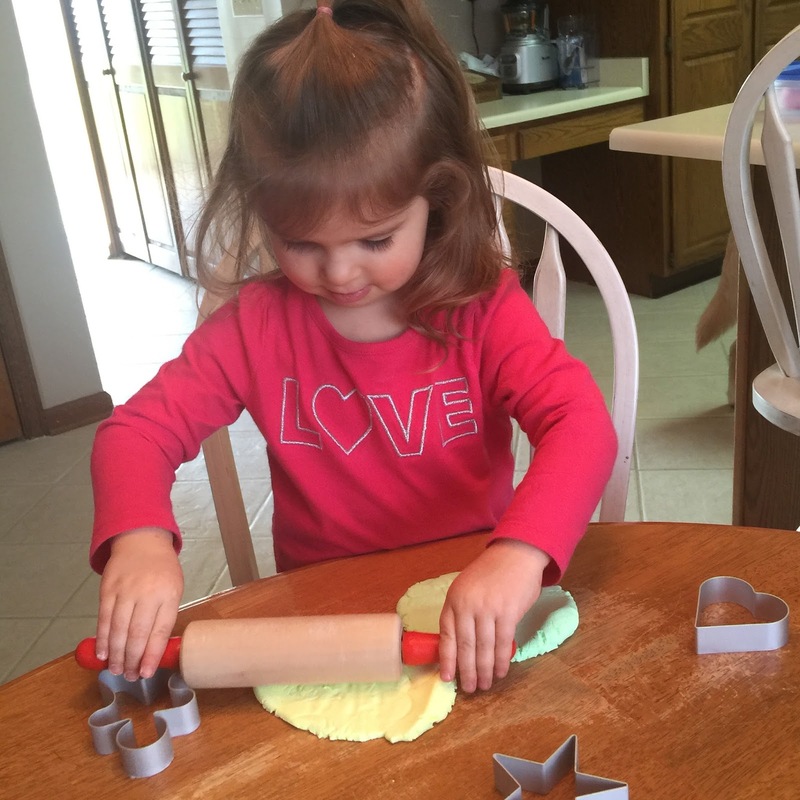 We have been working on fine motor skills to help my 3 year old learn to hold her pencil properly. Plus I used items to work on colors and letters. 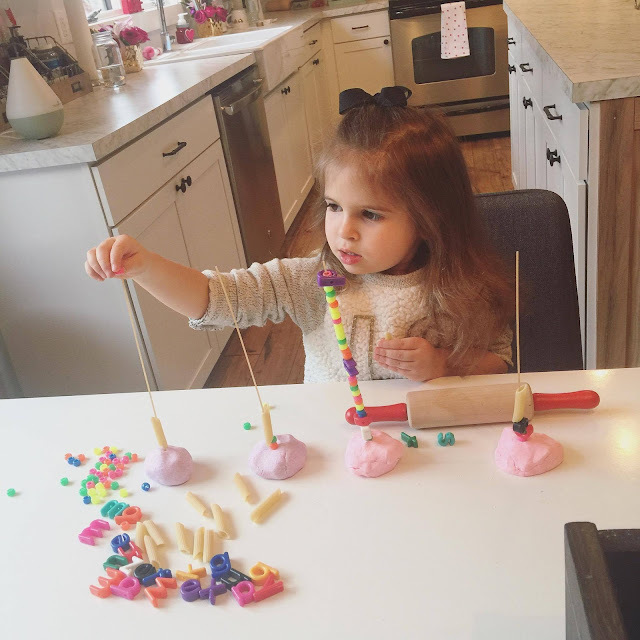 Santa brought her a new batch of my DIY Playdough. Yay!! We use the playdough as a base, place a piece of spaghetti in the center... then just thread the beads, letters and pasta down each stick. Hours of fun!! Grab letters to thread HERE!